Many people associate Spain with its landmark cities of Madrid, Barcelona, Sevilla, or Valencia. And many people associate Spanish food with tapas, paella and sangria. While all of those associations may be true, there is so much more to Spain than its tourist-rich cities and there is so much more to Spanish cuisine than jamon y tinto. 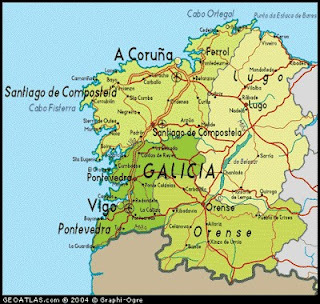 Galicia, the coastal region in the northwest corner of Spain, is not a tourist destination, except maybe for Pilgrims on the Camino de Santiago. However, it features fresh seafood and shellfish that can be followed from net to plate and fruits and vegetables harvested from the rich, fertile farmland that makes the Galician panoramas some of the most scenic in the world. Here's a sampling. Perhaps the most beloved dish of Galicia is pulpo gallego. Octopus can be found at nearly every feria, or market. It is cooked whole in giant copper pots. Then it it cut with scissors and served with toothpicks on a wooden plate drizzled with fine Spanish olive oil, paprika and sea salt. Washed down with local Estrella Galicia beer or house tinto and rustic bread, it makes the perfect snack during your market day excursion. 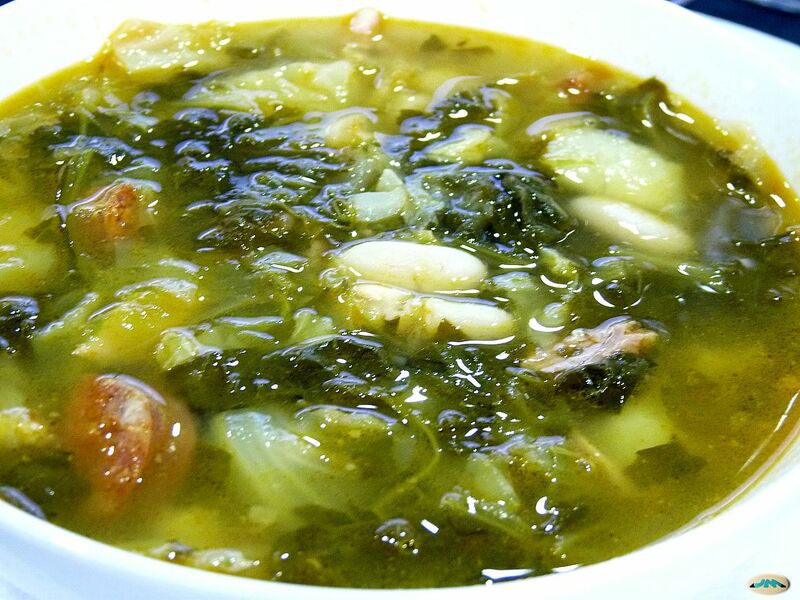 Caldo gallego is a simple broth of kale, potatoes and beans. Some chorizo or other meat may be used to flavor the caldo, as well as other vegetables, but regardless of variation, this hearty dish is a staple in the homes and restaurants throughout Galicia. 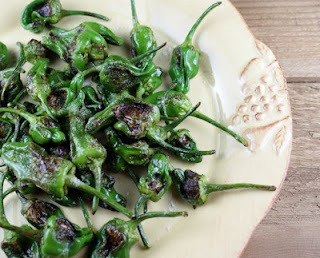 These tiny green peppers are fried in olive oil until their skins blacken, and are then dusted in sea salt. They appear as tapas and are also sold by the bagfuls at the markets. Most of them are mild, but every once in a while, you get a hot one. "Los pimientos de Padrón, unos pican y outros non"..."Peppers of Padrón, some of them hot, and others not." Empanadas in Galicia are not like the stuffed meat patties associates with Latin and Asian cuisine. Empanadas in Galicia are like giant round calzones, stuffed with meat, fish or vegetables. They are found at ferias and at festivals. This one, below, was stuffed with mussels. Galicia is also known for its famous almond Torta de Santiago, or St. James' cake, its soft, creamy tetilla cheese, its rustic round bread, pan de cea, and its high priced (and dangerously harvested) delicacy, the percebes, but one thing is true. Once you venture out beyond the obvious charm of Madrid and Barcelona, you will find that Galicia is a feast for the senses and after your visit to "Green Spain," your taste buds will leave you begging for more. I just returned to Massachusetts after 6 weeks in Portugal and Spain, of which two were spent in Galicia. Yo have captured the jest of it in your blog! I have been to Spain twice before, but never to this amazing region. I found the people warm, the land and sea scapes spectacular and the food....well 4 extra kilos should be enough answer for that! Great photos. Well written. Job well done!